It has only been almost 3 years since I last gave birth, but baby monitoring technology has become so much more advanced. Actually, during Berry's time, I had an internal baby monitoring system - i.e. I would wake up every so often just to check if Berry was awake, wanted milk, or was not covered by beddings. Lucky for my friend Sheryl Laudico, she chanced upon Snuza, a wireless baby movement monitoring device that was designed to give parents a good night's sleep. 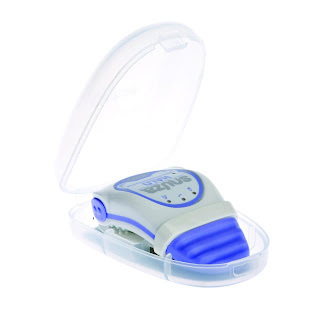 By clipping a Snuza Mobile Baby Movement Monitor to your baby's diaper, Snuza will detect the slightest movement during sleep, and alert you if movement stops. According to Sheryl, once she started using Snuza, her sleepless nights became a thing of the past. She loved it so much, she felt other parents would benefit from Snuza too, so she inquired with the manufacturer and became the Philippine distributor. How's that for seeing opportunity in sleepless misery? There are two types of Snuza: Snuza Go is Php4,989 and Snuza Halo is P6,189. Snuza Go! provides the same mobility and ease-of-use as Halo but does not incorporate the rousing vibration function. Obvs, Snuza will be in our "To Buy" list this time around! To all new moms & dads, expecting moms & dads and your family and friends, Snuza will be available sometime this month in Mothercare High Street. For inquiries, more info or to place an order, you may contact Sheryl at +63.917.556.0612 or visit Snuza Philippines on Facebook. Looks like a pretty useful device for a young mom like me. Thanks for the share Manila Fashion Observer.